December | 2015 | Superhero etc. Hello interweb, Nate here. So sorry about how 90’cember is going. I thought I’d be able to get the posts out weekly for December but obviously that’s not the case. I will try to get the remaining three 90’cember posts posted but it will end up stretching to January; although I won’t let it get to February. With that aside, 2016 is turning out to be a fantastic year for superhero comic book movies so I thought I’d count down the 5 films I’m most excited for! Hello interweb, Nate here. I apologize but today’s 90’cember post will be posted Monday instead. I promise that I’ll get it out Monday but I just want a few extra days to go through it and finalize it a bit more before releasing it for public viewing. With that said, see you guys Monday and have a happy weekend! Hello interweb, Nate here. Welcome to 90’cember, where I go over the over-the-top craziness that is 90’s comics throughout the month of December to celebrate the over-the-top craziness that is Christmas. 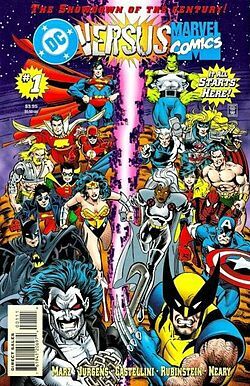 Today we’re going over the DC Vs Marvel comic book line and exploring the crossovers that occurred during the events. Side note: As most of you know, the second official Batman V Superman trailer recently been released. So despite the fact that we’re in the middle of 90’cember, I thought I’d post a trailer review of it tomorrow. You guys seem to enjoy those types of posts so what the heck!